Although pelvic ring injuries are rare injuries, they present a challenge for the orthopadic surgeon. These fractures typically occur in young patients and are usually the result of high-energy traumas . Based on these premises, the burden of these fractures is expected to be high [2,3], and the surgeon should try to minimize it. Patients with unstable injuries are typically initially treated with a temporary fixation [4,5] until definitive surgery can be performed. Involvement of sacroiliac joint (SIJ) has been detected in about 30% of pelvic ring injuries  and definitive surgery often requires percutaneous iliosacral screw placement. This technique is considered to be a highly demanding operative technique with a high rate of screw malpositions [7,8], which may be associated with the risk of neurologic damage or inefficient stability. The surgical technique for percutaneous SI screw placement has been described in several papers  but, according to our experience, several tricks may be added to those descriptions. If these fractures are treated expeditiously, the most accurate reduction is achieved and fixation failures are minimized, patients will achieve better outcomes . 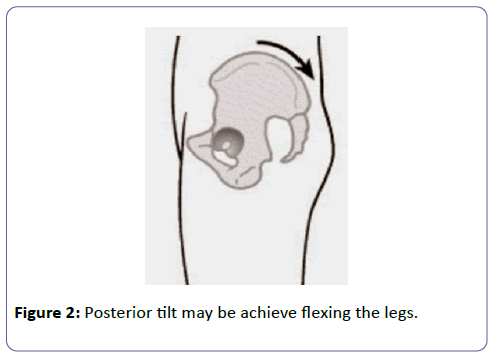 The purpose of this review is to summarize ten simple tips to help minimize failures and improve outcomes when positioning iliosacral screws. Prior to start the procedure, careful preoperative plan is of critical importance to determine the success or failure of the procedure. Morphology of the sacral area should be evaluated to choose the best placement of the iliosacral screw and to avoid dangerous placement . Complete and partial lumbarization of first sacral segment has been reported in about four percent of the population , this peculiar morphology may complicate a proper SIJ screw positioning: the screw may enter in the iliac ala, lie on the groove of the sacral ala then perforate the body of the first sacral vertebra (Figure 1). Avoiding this in-out-in placement is essential to minimize the risk of nerve injury: the l5 root lies close to the anterosuperior edge of the sacral ala and may be damaged by the drill or the screw itself. This complication may be avoided with three simple tricks: proper detection of lumbarization of the saral ala may be done on the Xrays (anteroposterior pelvic view usually shows this deformity), in case of minimal deformity the sacral ala groove may be evaluated and measured on CT scan while, during surgery, a lower and more posterior entry point may be choose to avoid in-out-in placement. If SI screw is placed in supine position, a full radiolucent table is helpful but the technique may be performed also on standard surgical tables. Standard table may not allow the C-arm to rotate as much to achieve a proper outlet (cephalad projection) view because of the presence of table’s column. This view requires the beam to be tilted about 35 degrees  but in patients with hyperlordosis, the angle may be even higher, and the table column may prevent this angulation of the c-arm. Since a perfect view is essential to avoid screw malposition, two tricks may be useful to achieve this C-arm rotation angle: the patient may be moved toward the foot end of the table as much as possible and the hips may be flexed to reduce the pelvic tilt (Figure 2). With the last trick a lower inclination angle is necessary to achieve a proper outlet view and perfect screw position may be performed bearing in mind to increase the opposite angle of the inlet view. Before starting surgery a perfect lateral view of the sacrum should be performed to choose the best entry point but it allows the surgeon to design vertical and horizontal sacral planes on the skin. According to our experience, this little trick is very helpful to change the wire direction during its insertion, especially when the wire placement should be changed because it is satisfactory in only one between inlet and outlet view (Figure 3). The so called “crescent fractures” involve a combination of ligamentous injury at inferior portion of SI joint, and vertical fracture of the posterior ilium which extends thru iliac crest [12,13]; in those cases posterior superior iliac spine remains attached to the sacrum therefore the risk of improper screw placement are higher. 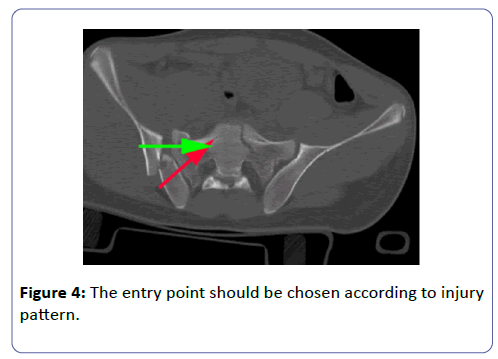 The choice of the entry point is essential in those cases and it should obviously be in the anterior part of the iliac ala (Figure 4). Preoperative planning and intraoperative entry point choice are essential to fix the anterior portion of the ala and not the posterior spine to the sacrum. Starting point in the posterior portion of the ala will lead to a residual instability of the pelvic and to poor clinical outcomes. In case of SIJ dislocation, compression of the joint is though to be essential to achieve a complete fusion. To achieve this aim, screw should be placed as orthogonal as possible to the SIJ. Usually the entry point should be slightly posterior and the screw should direct anteriorly (Figure 5a). A perfect placement may help to compress the joint in order to improve the achieved reduction and to minimize the risk of future incomplete fusion. On the other hand, a sacral ala fracture requires a screw placement as orthogonal as possible to the sacral sagittal line (Figure 5b). This may be achieved with a slightly anterior entry point and screw direction should be parallel to the horizontal plane of the surgical table. Again a perfect placement may help to give an optimal stability of the fracture’s fragments and will allow using a longer screw (see next tip). As recommended in Tip 5, a screw placement as orthogonal as possible to the sacral fracture is the best solution for those cases. 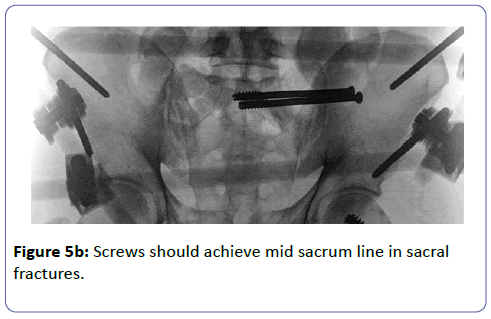 Furthermore to minimize secondary displacement and/or malunion screw’s length should exceed the half of the sacrum. This will increase stability of the fractures side involving the opposite hemi-sacrum into the resistance to displacement . If the screw do not involve the opposite hemi-sacrum the fracture will be held by few millimeters of the screw tip in case of Denis  type 3 fractures, and this may lead to failure . To increase the screw grip and the subsequent fracture stability we suggest to drill only the lateral iliac cortex, the medial one and the lateral sacral cortex. Avoiding to drill the full length of the wire is recommended to increase screw grip for two reasons: firstly the inside bone of the sacrum is cancellous and often weak; secondly screw tip is not fixed trough a cortical bone therefore its resistance to displacement is lower. Once the screw has been inserted, screw should be perfectly placed: either penetration into the iliac cortex either protusio of screw head should be avoided. Although easy in theory this step may be challenging because of the poor grip sensation due to surrounding soft tissues A combined inlet and obturator view may be helpful to chose the proper depth. According to our experience, obese patients present higher risk of secondary displacement therefore we suggest to use a second screw in patients with BMI higher than 30. A second screw may be placed in the second sacral vertebra  although this procedure presents the risks of nerve and vessels iatrogenic injuries (Figure 6). Although most of the opinion leaders agree to avoid weight bearing for two o three months after iliosacral fixation , there is no consensus about limitation of sitting position. 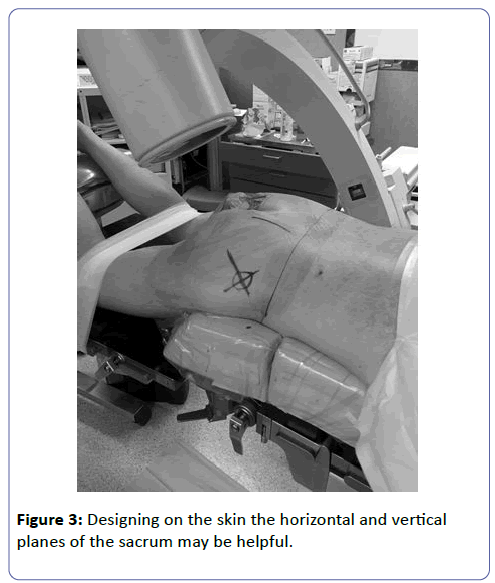 Our protocol recommend to avoid sitting angle over 40 degrees for 40 days after surgery. This recommendation is based on a published study  which demonstrated in simulation mode that sitting angle has a crucial influence in pelvis load and its intensity. Whether sitting at 90° the entire weight of trunk, upper limbs and head falls on the ischiatic tuberosities intensely stressing the structure, at 45° approximately 70% of the total load charges the pelvis and this percentage reduces to 26% at 15°. Those data show that pelvic fixation cannot bear a sitting angle above 45° without causing an out-of-range displacement of anterior and posterior complex. Although further study will be necessary to confirm or dispute those statement, we believe that sitting position should be avoided in the first weeks after surgery but we allow the patient to reach a position of 40 degrees for nutrition. 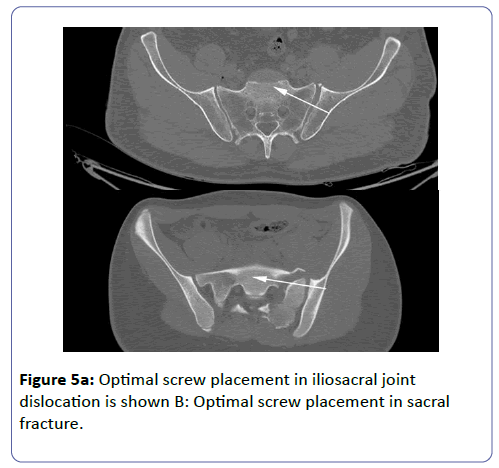 Sacroiliac screw fixation has become the most common procedure for iliosacral joint fracture-dislocations and sacral fractures in the last decade. 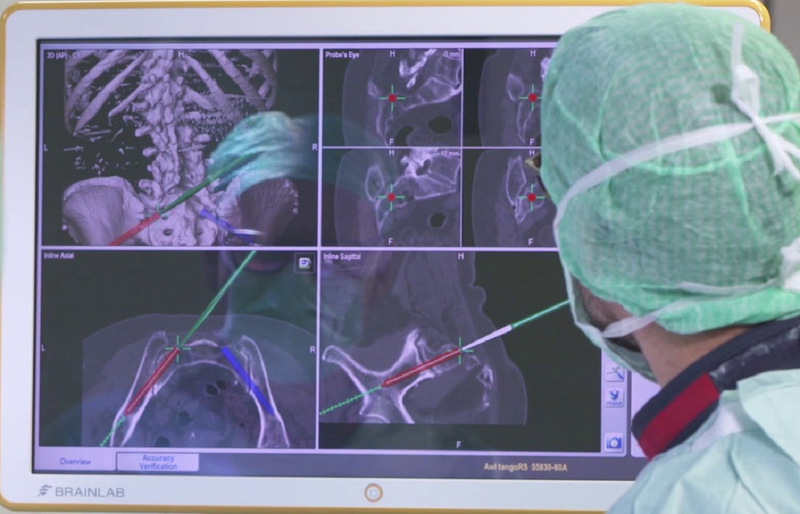 At present, the standard technique is the percutaneous iliosacral screw fixation under conventional C-arm fluoroscopy and it may be used also for complex fractures or in abnormal sacral morphologies. Although screw malposition has been reported, with several technique tips the risk of suboptimal screw placement has been reduced therefore we suggest to use CT navigation only if the view with image intensifier is poor. © 2018 Aprato A, et al. This is an open-access article distributed under the terms of the Creative Commons Attribution License, which permits unrestricted use, distribution, and reproduction in any medium, provided the original author and source are credited.